We extend a warm welcome to all that come through our door. We are a community that is accessible to everyone – all ages, body types, ability, and experience. Whether you are new to yoga and simply exploring what’s possible, looking for a breakthrough or looking to break a sweat, we have something for everyone. Our spacious, serene sanctuary is home to an active, engaged and vibrant community. We believe in fostering a positive, nurturing environment that challenges individuals to extend themselves through mind, body and soul. 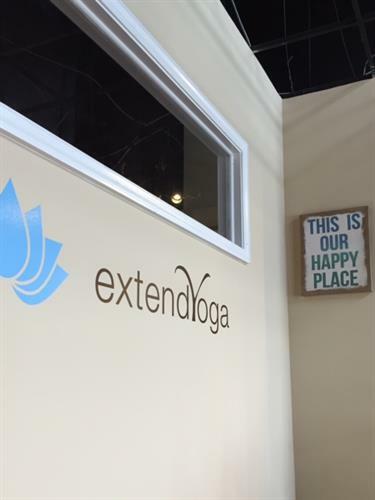 extendYoga’s guiding principles are social responsibility, a commitment to giving back and caring for the environment. We participate in worthy charities and organizations, frequently offer cause-related classes and events and strive to make yoga accessible by offering consciously affordable classes. We are conveniently located in North Bethesda between the White Flint and Twinbrook Metro stations and readily accessible from Bethesda, Rockville and Silver Spring. Just off of Randolph Road (northbound) and Twinbrook Parkway (southbound), we have ample, free parking. Yoga classes for anyone & everyone! We Are Green - and we LOVE it! Check out our awesome community - Join Us! New to Yoga? No problem!